Do we really know what we want? How sure are we that our current pursuits are honourable to God? What makes us think that we can run the lives the way we want it to be? How often do we grapple with what is important and what is not? Maybe, it takes a death or a diagnosis to wake us up from a senseless busy lifestyle. Maybe, it requires the shock of losing our familiar jobs. Maybe, it is a lack of understanding our need for rest. This week, I look at the importance of readying ourselves for true rest, by learning to regularly pause one day a week. For some of us, death is a rude awakening about the purpose of life. When Eric Clapton lost young Conor, his 4-year-old son, he fell into a deep period of grief, unable to make sense of it all. Amid the confusion, like many situations of suffering and pain, questions overwhelm answers. Answers if any, are few and far between. Why must the bedroom window be open at that time? Why didn't the house keeper keep an eye on Conor? Why must they live on the 53rd floor? Why are there no window guards to protect accidents like that in the first place? Why must this happen to me? If I am the father, I would be totally lost for words, let alone lost in the inexplicable wounds of losing a child. After all, sons ought to bury their fathers, and not the other way round. It is all so cruel and so unfair. Clapton pens the following words in the hit song, "Tears in Heaven." In moments of loss and pain, one cannot explain other than express. For many people, it takes a rude interruption before they start to ponder about the more important things in life. For some, it is a diagnosis of an advanced stage of cancer to wake up from slumbering through life. For another, it is the disappointment being laid off after years of loyal service to a company that prefers profits over people. People in their late forties are especially vulnerable. Having given their prime years to help the company grow and flourish, when hard times beckon, even good people are let go. For people such as Clapton, losing a dearly beloved, a good friend or colleague is a wake up call to embrace whoever that remains and whatever that matters more in life. Should we allow ourselves to become victims of such rude awakenings? What if we can prepare ourselves better? One thing is for sure. Rude awakenings are not the best situations to learn our need for rest. Personally, I believe that death is not something to be afraid of because we will all perish one day. No one is immune. It can be sudden. It can be unpredictable. It can come at the most unexpected moment, but we all will die one day. The wise will prepare a will for their loved ones. The foolish will procrastinate and wait until something happened. Usually, that would be too late. Like a fire or earthquake drill, we can all ready ourselves for the inevitability of life.What if taking a break one day a week is a way in which we can glimpse heaven? For Heaven is a wonderful place, we like to sing. According to Colton Burpo, heaven is a beautiful place in which he sees his older sister, and his grandfather. It takes a glimpse of heaven to see the beauty of living on earth. That is one reason why the book, "Heaven is for Real" has become such a bestseller. Other books about near-death-experience and forays into the heavenly realm have also been published. There is Pastor Don Piper's "90 Minutes in Heaven" that treats Piper to a brief moment of heavenly bliss and wonderful peace. Neurosurgeon Eben Alexander's "Proof of Heaven" gives a scientific take on showing that NDE is a real experience and heaven is more reality than fiction. These books became bestsellers. 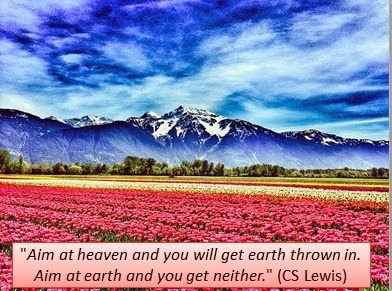 How do we aim at heaven? I suggest a 24/6 lifestyle. Work six days and rest one day. The Greek word for rest is "katapauo" which is an abode, a place where we settle down. It is a place we call home. It reminds me of the times of utter busyness, it is great to be refreshed with thoughts of why we are doing what we are doing. We think of home. We indulge ourselves in comfort food or pleasant thoughts. Taking a moment to rest does wonders to our spirits and our overall health. Hebrews teach us more. It is about imitating God. Like how he rested, we too need to rest. As followers of Christ, we must learn to follow after the ways of our Lord and our Master. Doing otherwise makes ourselves the masters, not God. Are you a busy executive or a young parent busy with your children's activities? Take a spiritual breather and let everyone else relax too. Do not become like a workaholic who wears oneself down. Who knows, you may also be wearing everyone else down. Are you an entrepreneur, employee on call, or a ministry worker? Learn to trust that God is watching over your concerns even when your eyes are off them. Your life is a life of faith remember? Taking a day a week flows out of that covenant of faith. Are you worried about the future? Don't. In glimpsing heaven one day a week, you will know that the future is not to be tainted with fear and uncertainty. The future is painted with the biblical strokes of a heavenly home, a pretty garden, a new city. For as we learn to take a rest once a week, we can benefit from what Matthew Sleeth had discovered, through resting away from worrying over worldly cares and concerns. In the process, one cultivates contentment. Thinking of heaven elevates hope and optimism. "One key element of happiness is contentment, and one of the foundations of contentment is optimism . Have a rest day. Not because you deserve it, but because you need it. More importantly, it builds contentment. Good Old Days or Brave New Future?